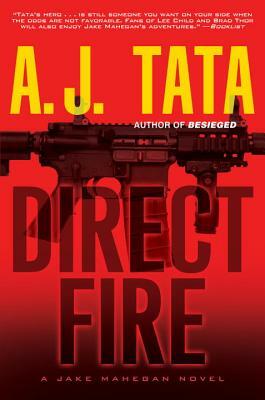 Packed with high-powered action and stunning authenticity, the novels of Brigadier General A.J. Tata have won widespread acclaim from the bestselling masters of suspense. In Direct Fire, he brings the war on terror to America—with his hero, Jake Mahegan, caught in the crossfire. . . .
A powerful banker, gunned down in cold blood. A military family, senselessly slaughtered as they sleep. A four-star general, hacked and framed by virtual assassins. Another key general, kidnapped from his farm near Fort Bragg. Atrocities like these are all too common in places like Iraq and Afghanistan. But this is the United States of America . . . When Jake Mahegan receives a distress call from General Savage in North Carolina, he rushes to the commander’s home—and walks right into an ambush. When the smoke clears, Mahegan is alive but the implications of the attack are as absolute as death: The terrorists are here . . . and no one is safe. Joining forces with Savage’s combat JAG officer, Alexandra Russell, Mahegan follows the trail to a killer who goes by the name “Jackknife,” a Syrian refugee-turned-terrorist who vows to avenge the bombing of a Syrian wedding—by killing as many Americans as possible. But time is running out for Mahegan. Terrorist cells are gathering in the Blue Ridge Mountains. Hackers are emptying the nation’s banks of millions of dollars. And their final act of vengeance will bring the whole world to its knees. For Mahegan, it’s time to kill. Now. Brigadier General Anthony J. Tata, U.S. Army (Retired), commanded combat units in the 82nd and 101st Airborne Divisions and the 10th Mountain Division. His last combat tour was in Afghanistan in 2007 where he earned the Combat Action Badge and Bronze Star Medal. He is the author of six critically acclaimed novels, Sudden Threat, Rogue Threat, Hidden Threat, Mortal Threat, Foreign and Domestic and Three Minutes to Midnight. He is a frequent foreign policy guest commentator on Fox News, CNN, CBS News, The Daily Buzz, and Tipping Point with Liz Wheeler. NBC’s Today Show featured General Tata’s career transition from the army to education leadership where he has served as the Chief Operations Officer of Washington, DC Public Schools for firebrand Chancellor Michelle Rhee and as the Superintendent of the 16th largest school district in the nation in Wake County/Raleigh, NC. He was most recently North Carolina’s Secretary of Transportation.